Writing a list of top coffee houses for Vienna is a bit like deciding on the best French wines. There are rather a lot of good ones, so it’s often a matter of taste and personal preference. But I canvassed opinion among friends and relatives to come up with this list of classic cafés, which will grow as more suggestions come in. Sadly, it falls to me to work my way through all the below one-by-one, bravely consuming excellent coffee and mountains of cake to bring you a local review of each establishment. There’s no need to thank me. Easily spotted because of the queues that always seem to snake out from the entrance. Possibly the most famous of the Vienna coffee houses and much loved by tourists (hence the queues). Trotsky and Freud both supped at their coffees in this 1860-built palatial building. In fact, in 1913, they both lived in Vienna at the same time as Tito, Hitler and Stalin, which must have led to some awkward conversations. I went into Café Central a skeptic and came out a believer. Famously the subject of one of Vienna’s best-loved songs, “Jö Schau” by the late Austrian songwriter Georg Danzer. The chorus includes the line, “What’s a naked man doing in Hawelka?”. A fair question. Austropop legend, Falco, celebrated his 30th birthday here, and other prominent guests have included Andy Warhol, Klaus Maria Brandauer, and Peter Ustinov. As I wrote in my review, the place is “as comforting as a pair of well-worn slippers”. Opened in 1880 and traditional home to archdukes, generals, artists and actors (the café is close to the Theater an der Wien opera house). Also known for its billiard tables and beautifully patterned upholstery. There’s a feeling of Edwardian elegance about the place – definitely one of my favourites. Newly refurbished in 2010 but originally designed by Adolf Loos in 1899. He was a regular guest, too, along with other giants of art and architecture, such as Otto Wagner, Gustav Klimt and Egon Schiele. 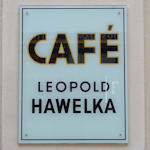 As with many cafés in Vienna, it upholds the traditional association between coffee house culture and literature with monthly public readings by authors. First opened in 1903. There’s even a theatre in the basement, reflecting the long association between coffee houses and the arts. Inside is a mix of Art Nouveau and 1950s “Mrs Maisel” design, and the café is a favoured haunt of students from the nearby University of Applied Arts. Another literary coffee house that traces its roots back to the 19th century. Known particularly for its inter-war interior design and neo-rococo ceilings. Its most famous guest was probably Austrian author, Peter Rosegger, who came very close to winning the Nobel Prize for Literature. A coffee house like a worn sofa; comfortable, relaxing and leaders of the counter-revolution against the pristine approach of more museal cafés. Seemingly oblivious to trends and the passing of time, Café Jelinek is a little off the beaten track, so less likely to be full of tourists (just full of Viennese). Oh, and piles of homemade cakes. Where high society goes to see and be seen. Opened in 1873 and located next to the Burgtheater and opposite city hall. So a common drinking hole for politicians and actors even today. Now the flagship coffee house of a group of family-run cafés. Notable for the large sheltered outdoor section and a jolly big and nice Christmas tree outside during the holiday season. A classic, but not in the “turn of the century” sense, thanks to the 1960s decor. A bustling little coffee house and a popular haunt for locals and those of an artistic disposition. Also famous for its toilets (seriously). Within walking distance of the Stephansdom cathedral. This one dates back to 1895 but was (fortunately) completely refurbished in 2018. Another café with glorious ceilings, upholstered wall seating and broad windows for plenty of natural light. So not one of the dusky haunts of yore. If you find yourself in the gardens of Schönbrunn Palace, pop into Landtmann’s Jausen Station.